The dynamic response of the Liyutan earth dam to the 1999 Chi-Chi earthquake (ML=7.3) in Taiwan was numerically analyzed. Both the horizontal and vertical acceleration time histories recorded at the base of the dam were used in the numerical simulations. The dynamic responses of the dam were analyzed for 50 s in the time domain. The simulated results were in agreement with the monitored data. The transfer function analysis and Hilbert-Huang Transform (HHT) were used to compare the results and to perceive the response characteristics of the dam. In particular, the time-frequency-energy plots of the HHT can reveal the timing and time frame of the dominant frequencies of the dynamic response. The influences of the initial shear modulus and uni-axial earthquake loading were also investigated. 1) Present an overview of transfer function analysis (TFA) that is traditionally used to quantify CA. 2) Describe MMPF method and its modifications. 3) Introduce a newly developed automatic algorithm and engineering aspects of the improved MMPF method. 4) Review clinical applications of MMPF and its sensitivity for detection of CA abnormalities in clinical studies. Using this technique, we recently showed that dynamic CA can be characterized by specific phase delays between the decomposed BP and BFV oscillations, and that the phase shifts are significantly reduced in hypertensive, diabetics and stroke subjects with impaired CA. In addition, the new technique enables reliable assessment of CA using both data collected during clinical test and spontaneous BP/BFV fluctuations during baseline resting conditions. 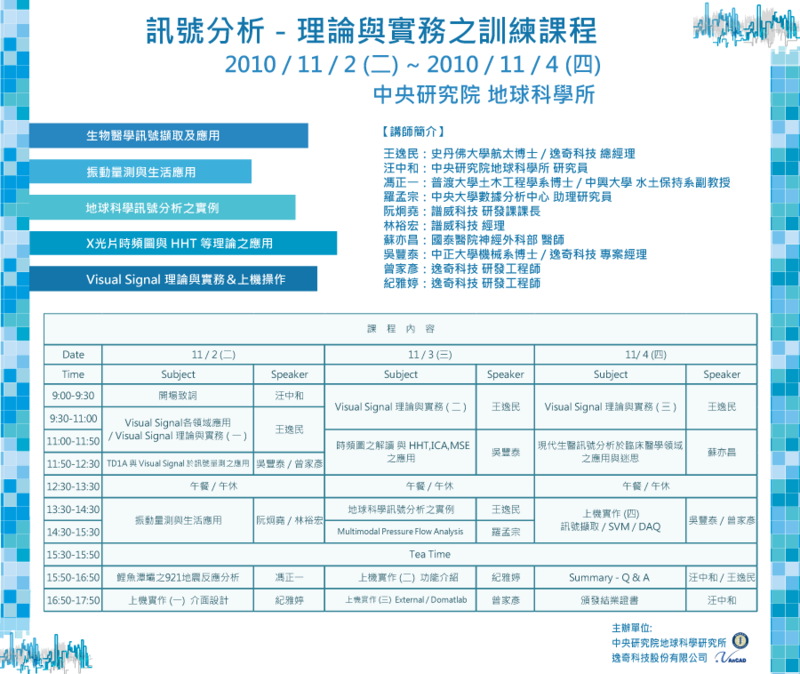 常用功能 ─ 說明Visual Signal內多樣化訊號視覺化控制元件庫，如Channel, Filter, HHT, Math, TFA, Transform 等訊號分析模組. 特殊功能 ─ 說明Visual Signal內特殊功能，如External, Do-matlab等訊號分析模組，大大增加Visual Signal使用之彈性. 訊號擷取 / SVM / DAQ ─　Visual Signal組整合了一般市售的 DAQ 硬體擷取卡，幫助使用者正確及輕鬆將資料抓取各種訊號；例如：振動、噪音、應變以及生醫訊號，包括 Temperature 、EMG 、 ECG 、EOG 、ECG 等等，讓使用者可以擁有虛擬示波器，但卻比示波器擁有更強大的分析功能；SVM模組包含基本的RMS、Peak、Peak to Peak，軸承損傷頻率，階次頻譜，聲音加權等方法，讓一般處理振噪問題的人員，能更容易且更快速的發現問題，進而解決問題!